Tailwater fisheries offer year-round fishing opportunities and are especially important to fly fishers who pursue trout through the winter. While typical freestone rivers are jammed with ice, tailwaters remain fishable for several miles below the dam and reservoir, which provide a constant water source. The stretch of ice-free water below a dam depends on the depth of the reservoir, releases, water temperatures, and the gradient of the stream channel. The greatest advantage to a tailwater fishery is this controlled source of water. Constant flows with ideal water temperatures, a weed-rich stream bottom with high levels of nutrients, and diverse aquatic insect populations are all key ingredients for growing large, healthy trout. Tailwater fisheries eliminate typical spring scouring by storing water and moderating flows. Later in the season a reservoir provides better-than-average flow when the natural flow would only be a trickle. Tailwater fisheries share many common characteristics, yet each has its own distinct flavor. Some are great winter fisheries, some accommodate anglers looking for wild trout, and some are uncrowded. This list highlights some of my favorite Colorado tailwaters and what they have to offer. Arkansas River, below Pueblo ReservoirWhen most fly fishers think of the Arkansas, they envision the river that flows unimpeded from the snow-capped Collegiate Range near Leadville, providing 150 miles of superb river fishing. Until recently, the upper Arkansas has overshadowed the tailwater below Pueblo Reservoir. But thanks to a multimillion-dollar stream improvement project that deepened the stream channel and added rock weirs and boulder gardens, the 8-mile stretch below Pueblo Reservoir has blossomed into a productive tailwater fishery. This stretch fishes best between November and March when flows are stable. Summer flows vary erratically between 300 and 1,200 cubic feet per second (cfs) depending on irrigation needs. The river is tough to wade when flows exceed 600 cfs. Autumn flows average between 150 and 300 cfs, and winter flows after November 15 range between 70 and 140 cfs. Anglers can expect hatches of midges, Blue-winged Olives, caddis, Yellow Sallies, Pale Morning Duns, and Tricos. Blue-winged Olives hatch all winter, and midge hatches make December and January two of the best months to fish dry flies. Consistent water temperatures from Pueblo Reservoir (mid 40s to low 50s) keep the trout active, and hatches are much more reliable, compared to other Colorado tailwaters at the same time of year. The highest trout numbers are in the 2-mile stretch immediately below the dam. The Colorado Division of Wildlife (CDOW) stocks this section regularly with rainbow trout. Standard regulations apply but catch-and-release is strongly encouraged. The average fish in this section is between 10 and 13 inches long, with the occasional 15- to 18-inch holdover. There are also a few large brown trout but they are difficult to fool. A bike path/hiking trail runs along the entire length of the river and there are seven parking areas for anglers, including a free lot just below the dam. To get there from Pueblo, take Highway 50 west, turn left (south) on Pueblo Blvd., turn right (west) on Pueblo Nature Center Road, and pull into the Nature Center parking lot. For more information, contact the Pueblo CDOW office at (719) 561-5300. The other parking areas between Valco Bridge and the dam require a Colorado State Parks pass, available at parks.state.co.us/. The lower sections—between Tortillas Flats and Valco Bridge—offer the best fly-fishing experience. There are fewer fish and the fishing is technically difficult, but the rewards are worth the effort. Crowds are nonexistent and the average fish is between 13 and 15 inches, with some trout exceeding 17 inches. Every now and then, a large brown trout surprises you. The lower section is not stocked, but fish from above migrate downstream, taking on all the characteristics of wild trout. Several techniques work well when pursuing these tailwater trout. A standard two-fly nymphing rig is especially effective in the riffles, runs, and pocketwater. Large #8-12 Prince Nymphs, crane fly imitations, and stoneflies, on a tandem rig with #16-18 tungsten Pheasant Tails, Mighty Mite Baetis, Mercury Pheasant Tails (natural and red), Sparkle Wing RS2s, and #18-20 Zebra Midges, Mercury Black Beauties, and Mercury Brassies are all effective. Dry/dropper rigs are effective in the shallow riffles and mid-channel shelves. Use a #14-16 PMX, #12-16 Rubber-legged Stimulator, #16-18 Goddard or Elk-hair Caddis, or #14-16 Parachute Adams for a dry-fly indicator, and drop any small, flashy nymph below that. Trout rising in the flats can be spooky so use a long 12- to 15-foot leader. For most hatches I use an appropriately sized Parachute Adams and slightly smaller Mathews’s Sparkle Dun. In autumn fishing streamers is often the best tactic to hook larger trout in the river’s lower regions. A #6-12 Barr’s Slump Buster (olive and rust), Black Conehead Bugger, or Halloween Bugger are good starting choices. South Platte River, DeckersThe South Platte corridor is a chain of world-class tailwaters providing a wide array of opportunities for fly fishers of all abilities. Elevenmile Canyon and Cheesman Canyon are excellent winter fisheries, but the less-publicized area near Deckers—at the junction of SR 126 and CO 67—is also an incredible tailwater with abundant access and lots of eager trout. When winter releases from Cheesman Reservoir stay above 70 cfs, the river remains fishable for several miles below Deckers. The stretch between Ox Yoke Ranch and Ouzel can also be productive, especially for dry-fly enthusiasts. Use #24-26 Parachute Adams, #24 Hi-Vis Baetis, #22-24 Griffith’s Gnats, #22 Cannon’s Snowshoe Midge Emergers, #22-24 Matt’s Midges, and #20-24 Betts’ Zing Wing Midges. If there are no apparent risers, anglers should dead-drift tiny nymphs in some of the traditional winter runs. Savvy anglers fish the slow, deep pools and stay away from the fast pocketwater. Effective patterns include #20-22 Mercury Pheasant Tails, #22-24 Sparkle Wing RS2s, #22 Rojo Midges, #20-22 Mercury Blood Midges, #20-24 Black Beauties, #20-22 Rainbow Warriors, and #20-22 Mercury Midges. Recovering from the Hayman fire in June 2002 (see “Cheesman After the Fire,” September 2005), Deckers is making a remarkable comeback. The CDOW has instituted an aggressive stocking program to combat the loss of fish due to fire, flood, and whirling disease. More than 40,000 fingerling rainbows have been planted between Deckers and Scraggy View in the past three years. Many year classes are present, with the average rainbow ranging from 10 to 12 inches. Wild brown trout averaging 8 to 13 inches also supplement the rainbow population. Some trout stray from the private fishing club water upstream, offering anglers the opportunity to catch Kamloops rainbows in the 18- to 24-inch range. Also worth visiting in the winter is the 4-mile stretch of the Blue River below Dillon Dam in Silverthorne, which offers convenient, year-round fishing. South Platte River, Waterton CanyonWaterton Canyon is the closest tailwater fishery to metropolitan Denver, providing several miles of beautiful trout stream between Strontia Springs Dam and Chatfield Reservoir. To get there, take the Wadsworth Blvd. exit from C-470 and go south about 5 miles to Waterton Road. The parking area is on the left. 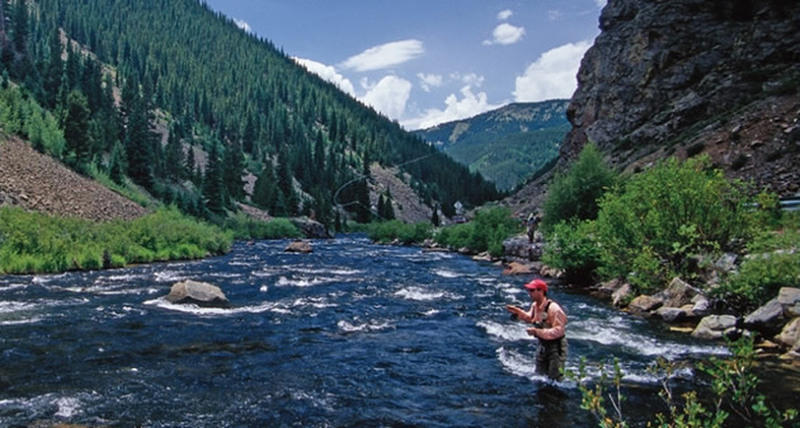 Waterton Canyon has a robust population of small to medium brown trout that are eager to take flies. The river has deep holes, swirling pockets, and nice riffles and runs and is loaded with insects, including tiny midges and mayfly, caddis, and stonefly nymphs. The pocketwater is especially productive if you use large beadhead nymphs. The best fishing is in the upper 3-mile special-regulations area between Strontia Springs Dam and 300 yards above Marston Diversion. The flies-and-lures-only area allows a limit of two fish, 16 inches or larger, but the fly-fishing community and Trout Unlimited encourage catch-and-release. The lower river is more of a put-and-take fishery supplemented with stocked rainbows. Anglers catch some nice holdovers in the lower section, especially in the quarter-mile stretch below the Marston Diversion. February is a good month for midge hatches and dry-fly enthusiasts. Productive flies include #20-22 Griffith’s Gnats, Matt’s Midges, and Parachute Adams. During nonhatch periods, fish standard South Platte patterns such as #20-22 Mercury Midges, Black Beauties, Rojo Midges, Rainbow Warriors, and South Platte Brassies. As April unfolds, Blue-winged Olives begin to hatch, offering consistent dry-fly fishing with mayfly duns. A #20-22 Parachute Adams, Mathews’s Sparkle Dun (BWO), or Hi-Vis Baetis will fool these rising fish. During the first week of May, expect to see good caddis hatches and excellent dry-fly fishing with a #16-18 Goddard Caddis or tan Elk-hair Caddis. Before the hatch, fish a #14-16 Beadhead Breadcrust, #16 LaFontaine’s Sparkle Pupae, or a #16-18 Mercury Caddis. During July’s Pale Morning Dun emergence use #18 Barr Emergers or Mercury Pheasant Tails. Effective dry flies include #18 Mathews’s Sparkle Dun, Cannon’s Snowshoe Dun, and Stalcup’s CDC Biot Comparadun. Starting in mid-August, Tricos become important. The duns begin to hatch about 7 A.M., and the spinner fall takes place between 9:30 and 11 A.M. Stalcup’s CDC Comparadun (#24) is the ticket for these surface feeders. August also brings some excellent hopper fishing with #10 Dave’s Hoppers. Other terrestrials, such as beetles and ants, are also effective. As fall approaches, Blue-winged Olives hatch between 1 and 3 P.M. Use #20-22 Mercury Pheasant Tails, Barr Emergers, and Sparkle Wing RS2s before, during, and after the hatch. All the previously mentioned dry flies will also fool trout when they are eating mayfly duns. Taylor and Frying Pan RiversIt’s a toss-up. Anglers in search of trophy-size trout should focus their attention on either the Taylor or Frying Pan rivers. Both have large, healthy trout that fatten quickly on a diet of tiny midges, mayflies, and Mysis shrimp. Although most of the fish in these waters are measured in inches, trout of 6, 8, and even 10 pounds are caught in the upper pools on small flies and light tackle. The short, quarter-mile catch-and-release section below Taylor Park Reservoir—commonly referred to as the Hog Trough—boasts some of the biggest trout in Colorado, but catching them is no easy task. To be successful, you must have a keen eye and be able to dead-drift tiny nymphs with flawless technique. Crystal clear, swirling currents and high banks add to the complexity and difficulty of this fabled trout stream. The brown and rainbow trout have become sensitive to split-shot and strike indicators, and often move out of the way as your flies drift by. Use fluorocarbon leaders and tippets and Airflo Di-Do 2 green tungsten putty to weight the fly. Your casting must be razor-sharp because the best chance to fool a Taylor River hog is on the first drift. After a few casts, trout either drift off to deeper holding water or develop lockjaw. The Taylor River has good hatches of midges, Blue-winged Olives, Pale Morning Duns, caddis, and Green Drakes that bring even the large trout to the surface. I once watched a friend fool a 9-pound rainbow with a #16 orange Stimulator. The stretch below the dam is fishable year-round but temperatures can be extreme at this altitude in the Rockies. FR 742 is plowed regularly, but it can still be snow-packed and icy in the shaded canyon. Use tremendous caution when traveling this treacherous terrain. There is sometimes 3 to 4 feet of snow along the river, which complicates things when you are trying to walk from hole to hole. This beautiful tailwater is one of America’s most popular year-round destinations. Despite the crowds, there is always an opportunity to catch an assortment of brown, rainbow, cutthroat, and brook trout. The best fishing for big trout is between the Bridge Pool and the Toilet Bowl. The Toilet Bowl is the plunge pool below the outlet and is loaded with some of the biggest trout in the river. The next two deep areas—the Bend Pool and Gauging Station—are also excellent places to target large trout. Downstream of the Gauging Station, the trout become smaller and slightly easier to catch. Use the same flies and tactics as mentioned for the Taylor River. A combination of high-stick nymphing and sight-fishing is the key to consistently hooking trout in this section. On both rivers it’s important to ignore the nonfeeders. Some anglers spend hours trying to catch large, plainly visible trout that are not feeding. Look for suspended trout, as this is a sure sign they are actually eating. The most effective nymphs are #20-22 Black Beauties, Barr’s Pure Midge Larvae, Jujubee Midges, Mercury Blood Midges, Candy Canes, RS2s, and #16-18 Mysis imitations (there are many). Most anglers use a standard two-fly nymphing rig with a Mysis shrimp as an attractor, and drop a small mayfly or midge imitation off the eye of the upper fly. As a result of whirling disease, brown trout now fill the habitat on the Williams Fork where rainbows once thrived. Populations of wild brown trout have exploded in the 2-mile stretch below Williams Fork Reservoir, producing a robust, self-sustaining, catch-and-release fishery. To get there, go south on CR3 about 1 mile from Parshall to the CDOW parking lot. Follow the footpath to the river. This scenic, wild-trout fishery has amazing trout habitat, including riffles, runs, pools, and productive pocketwater. The average fish is between 8 and 15 inches, with the occasional rainbow and resident brown trout between 16 and 18 inches. Anglers can expect excellent hatches of midges all year. Effective dry flies include #26 Parachute Adams, #22 Brook’s Sprout Midges, #24 Matt’s Midges, and #22-24 Griffith’s Gnats. By the second half of April, Blue-winged Olive hatches are excellent. Use a #20 Sparkle Dun or Hi-Vis Baetis for surface feeders. Before, during, and after the hatch, use #18-20 Barr Emergers, RS2s, and Mercury Pheasant Tails. Caddis begin hatching during the first week of May, offering consistent dry-fly fishing. A #18 Buckskin or #16 Beadhead Breadcrust work well in the faster riffles and runs. The Red Quill hatch in August is one of the highlights of the summer season, and late in the afternoon you can often find rising fish feeding on the mahogany-colored duns. A. K.’s Red Quill (#16) is a local favorite for this hatch. Starting in late September, brown trout as large as 24 inches run from the Colorado River into the Williams Fork to spawn. These large browns take the regular list of midge imitations but egg patterns, #14 brown or red San Juan Worms, and streamers are also good this time of year. A #8-10 Barr’s Slump Buster is especially effective fished tight to the bank. Blue-winged Olives and midges round off the autumn season with good nymphing and dry-fly fishing until the end of October. All of the previously mentioned flies for the spring hatches apply here too. Around the bend of each of these tail­waters awaits a treasure chest filled with opportunity and undisputable beauty. The super-selective and discriminating trout that have adapted to these environments are worth the effort.